Chicago’s restaurant scene has recently suffered some setbacks. 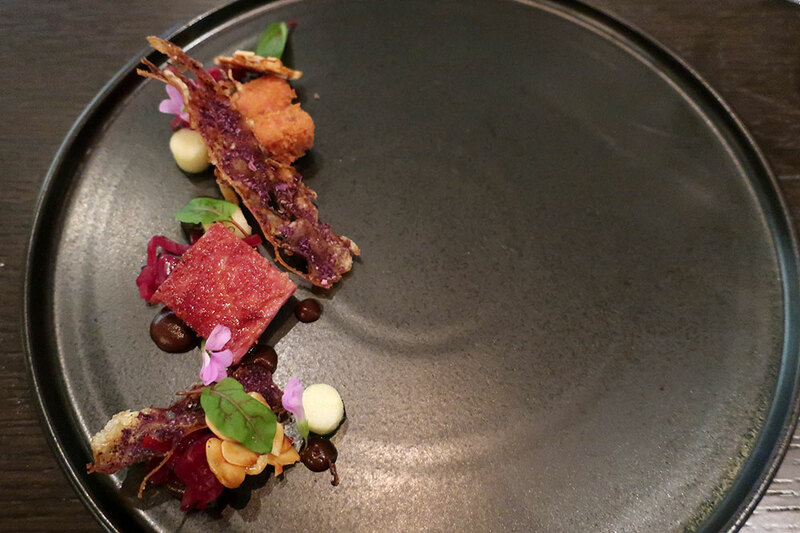 Three excellent restaurants closed — Sixteen, 42 Grams and Grace — taking with them a total of seven Michelin stars. One local columnist wrote a controversial article about how “Chicago’s once-vaunted dining scene has lost its luster.” Fortunately, the vacuum left by the closures of these notable restaurants is rapidly being filled. Even though I restricted myself to restaurants that had opened in 2018 (except for Bellemore, which opened in November 2017), I discovered eight notable venues serving cuisine that ranged from satisfying to sublime. Some of the restaurants below will doubtless claim Michelin stars in the year to come. In 2019, dining in Chicago promises to be as delightful as ever. Celebrity chef Rick Bayless opened this cellar bar and restaurant beneath his flagship venues, Frontera Grill and Topolobampo (the entrance is in the alley behind these restaurants). It can get a little loud — because of conversations more than music — but the vibe is festive, and the service is both friendly and efficient. Bayless’ daughter, Lanie, who greeted us and showed us to our table, was largely responsible for the vast selection of mezcal offered at the bar. Each of the mezcal-based cocktails we tried was superb, ranging from the fresh and complex “El Sótano,” with green Chartreuse and lime, to the sweet, savory and citrusy “Tacos al Pastor,” which incorporated chorizo-infused mezcal. The food also impressed. 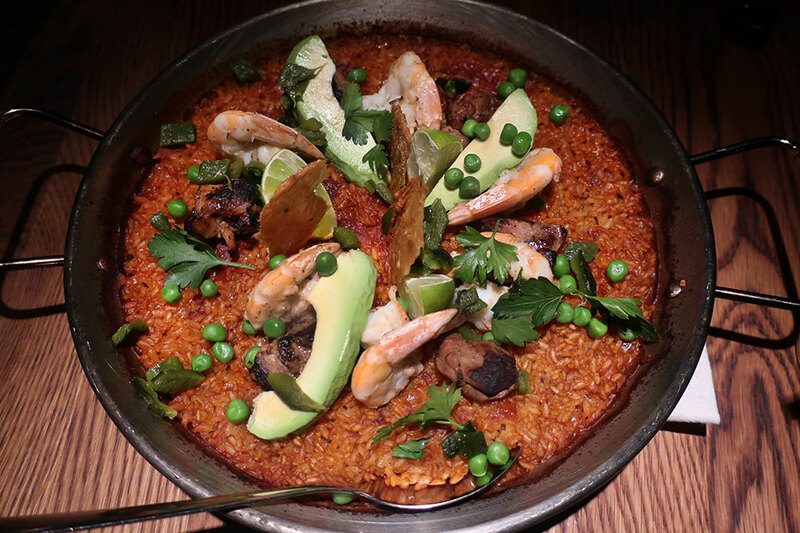 We tried a fresh and well-balanced yellowtail aguachile, roasted vegetables in rich almond mole, and delicious “Mexican paella” with shrimp, avocado, poblano peppers, chicken thighs and chicharrones (crispy chicken skin). And we couldn’t resist a dessert of plantains “Foster” in tequila-infused custard topped with Mexican vanilla ice cream. Bellemore’s chef, Jimmy Papadopoulos, used to run Bohemian House, an upscale Czech spot we once recommended. 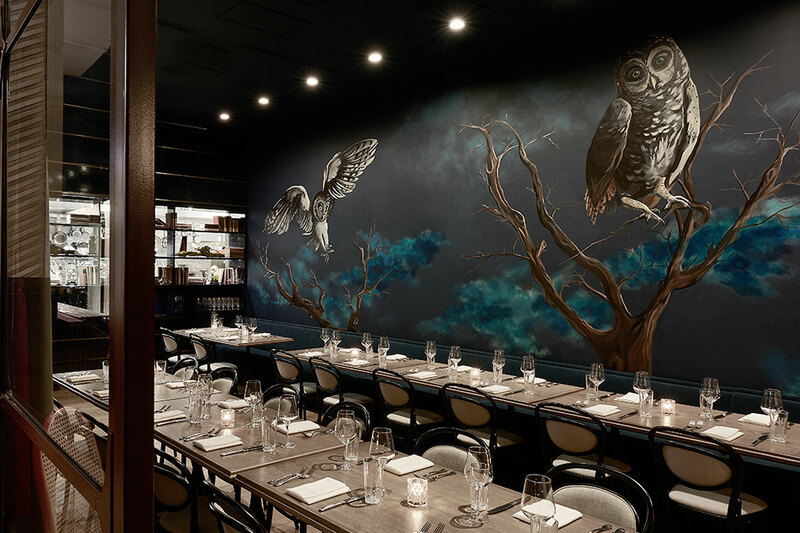 His new venture serves “artistic American” cuisine in a stylish space that has the feel of a 1920s brasserie, with aristocratic accents of stuffed peacocks. Things started off on the wrong foot — the cocktails we ordered while waiting for our table took 15 minutes to arrive — but improved rapidly from there. Standout dishes included a clean, delicate and flavorful grilled-vegetable soup accompanied by toast topped with creamy stracciatella; ethereal shaved foie gras with crunchy cacao-nib granola and persimmon; and crispy-skinned wild Arctic char with bitter radicchio, sweetly earthy chanterelles and tangy tamarind. Our waiter was a little unctuous for my taste but friendly and efficient nevertheless. Tucked away on the far side of the commuter railroad tracks from the Sophy Hyde Park hotel, this cozy wine bar feels very Hyde Park: Bookcases full of used books (all for sale) line its walls. I loved the cocktail list, with drinks inspired by notable works of literature. “The Painted Veil,” mixed with Old Tom gin, plum-lemongrass syrup, Sichuan bitters and a spritz of “saline wash,” for example, had an appealingly citrusy, aromatic and slightly mineral character. The wines-by-the-glass list was also commendable, with unusual options like a refined Savenières from the Loire and a roundly fruity Cannonau from Sardinia. And I enjoyed the boozy desserts, including a creamy gin-and-tonic cheesecake, and a heady pie of amaretto-infused chocolate ganache, amaretto whipped cream and candied almonds. But the savory dishes fell flat. 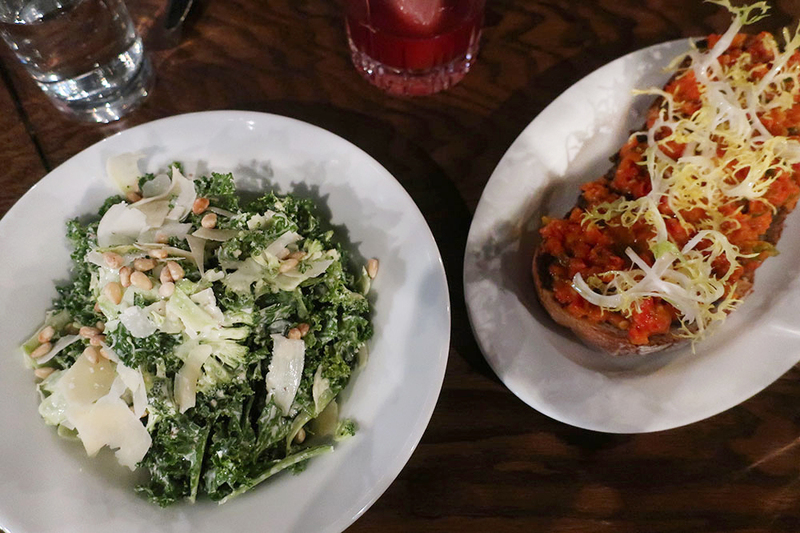 The shaved-broccoli-and-kale salad had an overly fishy Caesar dressing, the mushroom toast with red-pepper relish and goat cheese tasted oddly sweet, and the green-chile shrimp managed to feel both rubbery and mushy. Only the beef-filled cabbage rolls were something I’d consider eating again. Bibliophile is fun for drinks or desserts, but dine elsewhere. This pocket-size restaurant in the gentrifying Uptown neighborhood occupies the space formerly belonging to the Michelin two-star 42 Grams. I appreciated the renovation, which replaced the counter seating with tables. Like 42 Grams, Brass Heart requires that patrons purchase tickets in advance in order to dine (the cost includes tax and tip but not drinks). Considering the quality of the food and service, the $125 price tag for the nine-course menu seems like an excellent value. 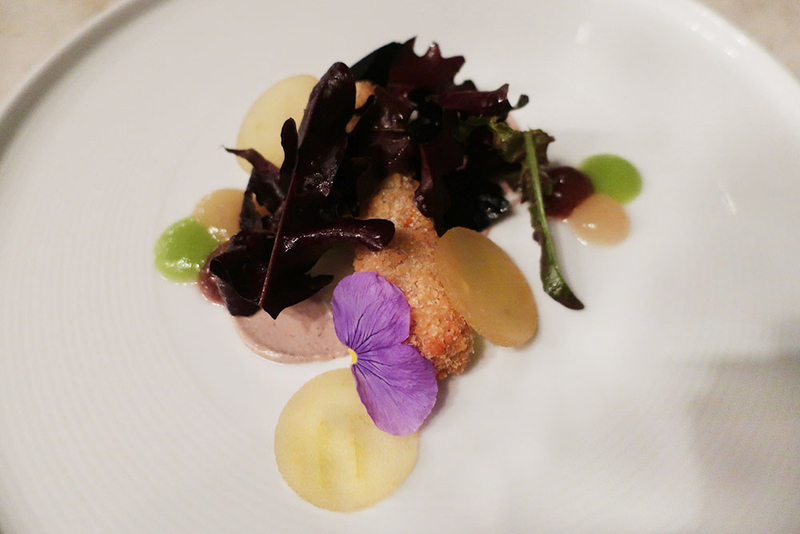 A couple of dishes didn’t work, notably the flavorless rice and beans with pork streusel, and a disjointed course centered on a duck confit croquette. But the rest were absolutely delicious. I relished the savory “Ham and Eggs” course with country ham, ham broth and a quail egg; the pumpkin panna cotta topped with a pumpkin chip and Osetra caviar; and gorgeous halibut confited in duck fat with yuzu and a gelée of foraged spruce. Wines by the glass, such as a graceful Jura Chardonnay and an elegant, powerful Nielluccio from Corsica, rose to the occasion. Last year saw something of an omakase explosion in Chicago, with the openings of Kyōten, Omakase Takeya and Omakase Yume. Choosing among them was surprisingly simple; Omakase Yume and Omakase Takeya are both about $100 less expensive than Kyōten, and Omakase Yume has the added advantage of being BYOB. With a bottle of sparkling wine in hand, we sat down at the counter, which holds just eight diners (seatings are at 5:30 and 7:30 p.m.; don’t be late). Each of the 15 or so sushi courses was only a bite or two, but each was deceptively simple and wonderfully delicious. I especially liked the rich otoro (fatty tuna) topped with charcoal salt; the cloudlike kinmedai (golden eye snapper), which practically evaporated in the mouth; the brilliant kanpachi (amberjack) with savory sesame oil-spiked seaweed salad; and the sweetly smoky flame-seared hotategai (scallop) topped with a purée of plum and jellyfish. If you’ve never experienced an omakase-style dinner, this restaurant is a fantastic place to try one. Always in search of restaurants with a sense of place, I had high hopes for Twain, which presents a menu “celebrating the history of Midwestern cuisine,” according to its website. I liked its unusual décor, with colorful felt wall murals and even chandeliers made mostly of felt, hanging from a wood-beamed ceiling. And I enjoyed an appetizer of spoon bread topped with tender, slightly spicy shredded pork, cool sour cream and crunchy peanuts, as well as a flavorful side dish of grilled zucchini with capers. 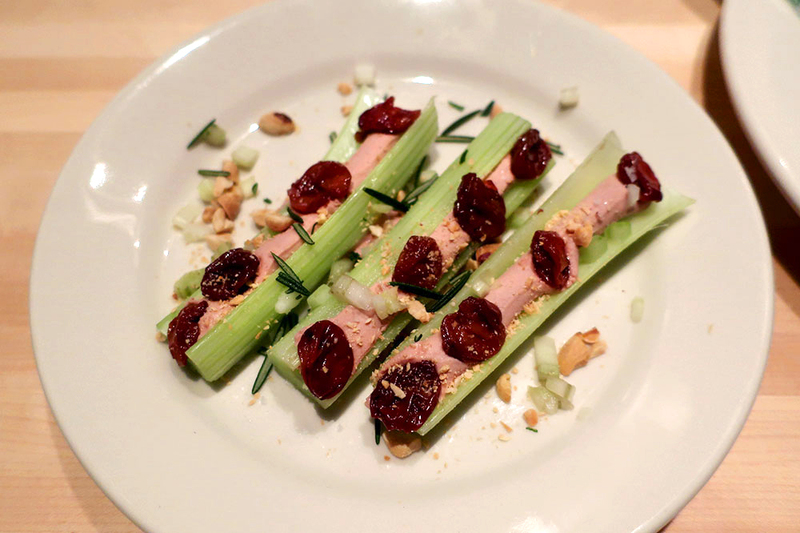 But the “Ants on a Log,” composed of celery topped with a duck foie gras-peanut mousse, dried cherries and rosemary, became tiresome after two bites. The bone-in pork chop of my “Pigs in a Blanquette” was underseasoned, though the accompanying shredded pork tongue was delicious. My spouse’s “Surf and Turf” of underseasoned meatloaf and rather fishy unagi (eel) also proved disappointing. I may try Twain again when I return to Chicago, in the hopes that it settles in, but for the moment, its food is uneven in quality and not worth the trek to Logan Square. A short walk from the Sophy Hyde Park, this fashionable restaurant serves delicious upscale soul food. 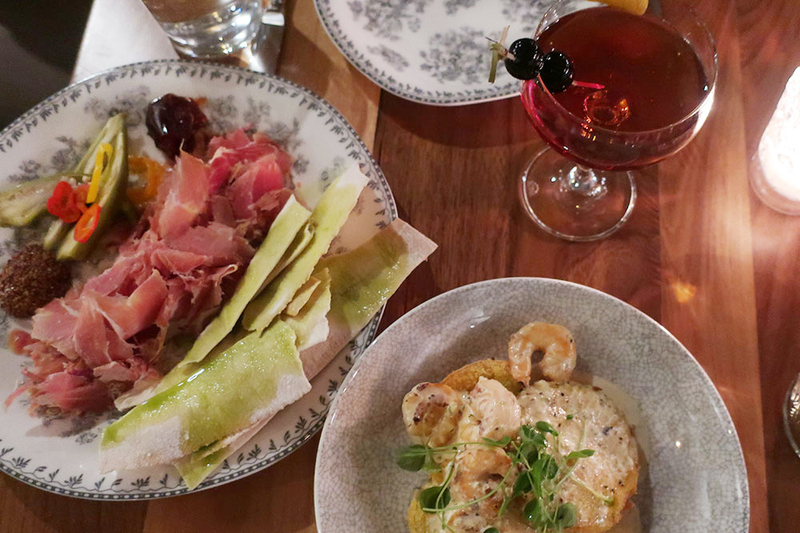 I loved both of our appetizers: a plate of perfectly crunchy green tomatoes topped with a rich remoulade and slightly spicy shrimp, and a pile of finely shaved country ham with pickled okra, grainy mustard, paper-thin crackers and pepper jelly. I also relished my giant, juicy pork chop accompanied by a yam-filled apple, but my spouse’s beef short rib was a bit underseasoned. 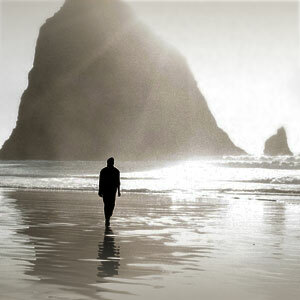 Every person on the staff whom we encountered was highly professional and friendly. The manager came by to check on us, and when I mentioned that our main courses arrived before we were finished with our appetizers, he apologized and gave us a complimentary dessert of a buttery pecan tart. Although Virtue has been open only a short time, it’s already heading for the top of the Hyde Park restaurant scene. 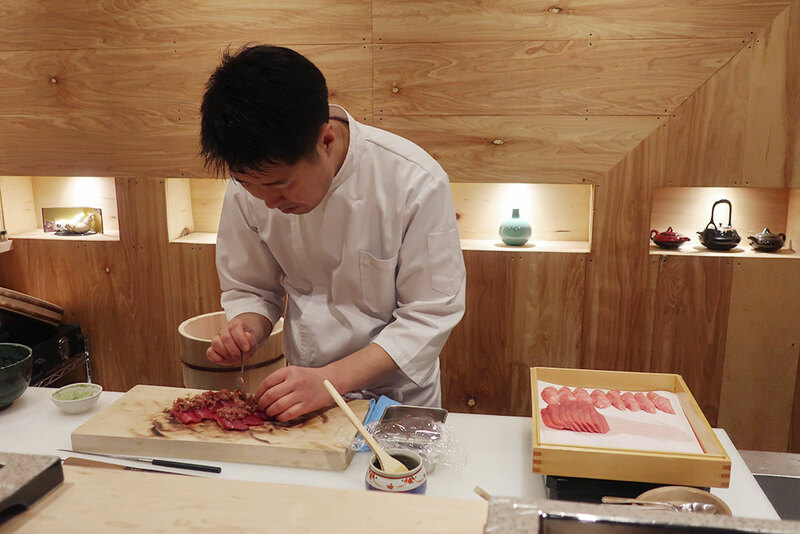 This high-end Japanese restaurant has a tough act to follow; it recently opened in Grace’s former digs, which earned three Michelin stars. The clean-lined space looks similar — the same comfortable white leather chairs remain, for example — but the menu is quite different, presenting highly contemporary interpretations of classic Japanese dishes, such as chawanmushi, shabu-shabu and miso soup. Although we visited less than a month after the restaurant’s opening, service already exhibited polish and precision. Even simple gestures, like pulling out our chairs or pouring our glasses of water, were accomplished simultaneously and ceremonially. I couldn’t find fault with any of the nine courses on the expensive tasting menu, and several were nothing short of stupendous. A dish of Alaskan king crab with puffed rice, trout roe, a tamari-cured egg yolk and uni butter elicited sighs of pleasure, as did a bowl of delectable Kurobuta tonkatsu (deep-fried, breaded pork) with apple and red cabbage.